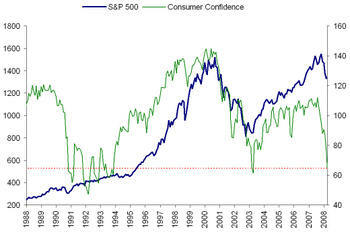 The Consumer Confidence index was reported at 64.5 earlier this morning, the lowest reading on the index since 3/31/03. The US markets initially traded down on the report, which was less than expected and 14% below the previous report. Initial reaction aside, the chart below shows that such negative sentiment occurs more frequently with a market bottom than a market top.